Surface defect detection, which is carried out in advance of defect review process during surface defect inspection of products having smoothly finished surfaces such as bare semiconductor wafers, magnetic disks, and optical components, is important process to assure the quality of products. 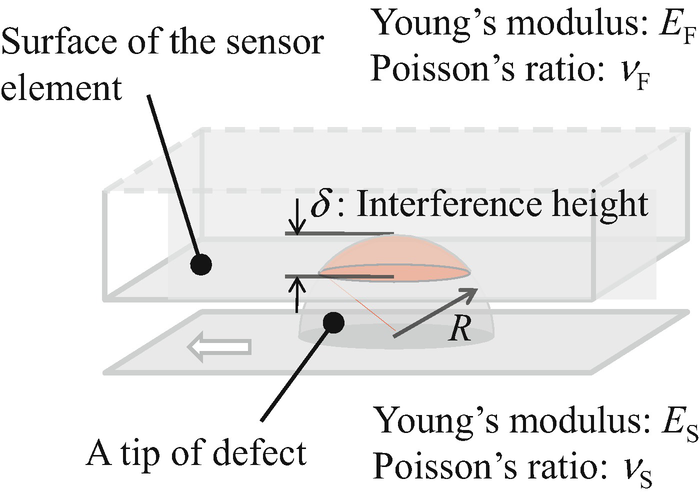 In this chapter, a surface defect detection method, in which defect detection is carried out in such a way that the existence of a surface defect on a target of interest is verified by detecting frictional heat induced by a collision between a micro thermal sensor and a surface defect, is described. 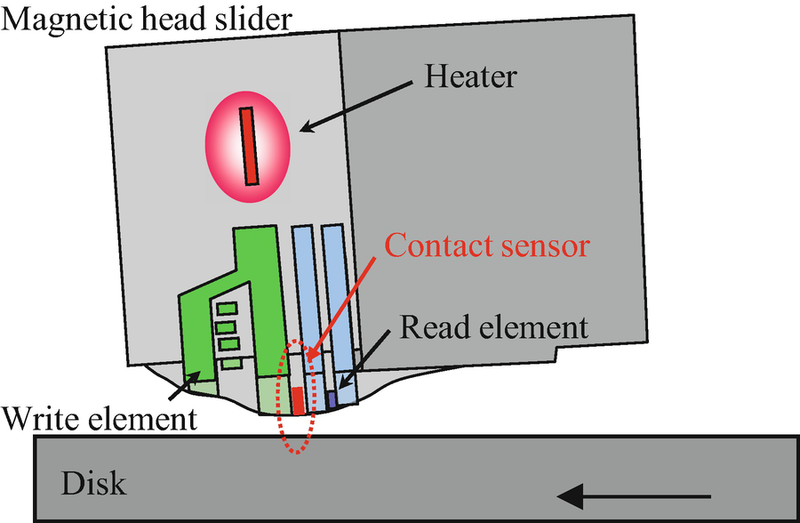 Although the frictional heat to be generated by a collision between the micro thermal sensor and a surface defect is expected to be small since surface defects required to be verified during the inspection are quite small, the micro thermal sensor designed to have a micrometric sensor element is expected to carry out highly sensitive detection of the frictional heat and thus realize high-resolution surface defect detection. A principle of the surface defect detection method based on the micro thermal sensor is at first described. After that, design and fabrication of the micro thermal sensor based on photolithography process are presented. In addition, by using the developed micro thermal sensor, some experiments have been carried out to demonstrate the feasibility of the defect detection method. An example of the application of micro thermal sensor for surface defect detection in the hard disk drive industry is also introduced. Precision components having smooth surfaces such as wafers, magnetic disks, and optical components are expanding their applications in many industrial fields. In such a precision component, surface quality is one of the most important factors that affect the quality of product in which the component is employed, and therefore the surface inspection is important in the fabrication process of those products. Two of the main processes in the surface inspection are defect detection process and defect review process that will be carried out followed by the defect detection. In the defect review process, high-resolution measuring instruments such as atomic force microscopes (AFMs) or scanning electron microscopes (SEMs) are often employed. Meanwhile, since the field of view (FOV) of these high-resolution instruments is limited in most of the cases, defect detection process is necessary to obtain positional information of surface defects in advance of the review process. 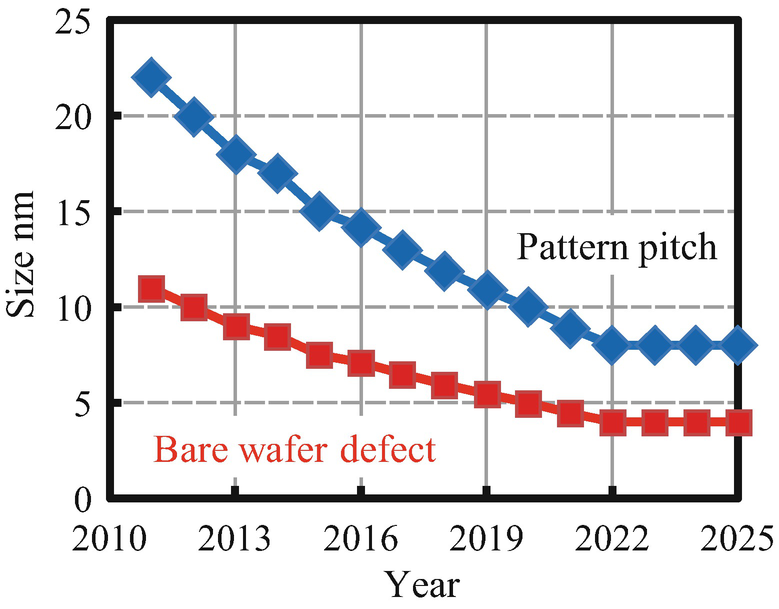 In the case of semiconductor industry, due to the advancement of the technology node, the allowable size of surface defects is decreasing year by year as shown in Fig. 1 (ITRS overview 2011). Although the AFMs and SEMs have enough resolution to carry out the review process, it is becoming more difficult to find the existences of surface defects since the allowable size of which is becoming smaller and smaller. A traditional method for surface defect detection is laser scattering method (Lonardo 1991; Takami 1997; Takahashi et al. 1998), in which the existence of a surface defect will be verified by detecting scattered light rays from a surface defect irradiated by an incident laser beam (Fig. 2). Owing to its principle, nondestructive defect detection can be carried out, as well as the classification by the image processing techniques (Pan and Tai 2011; Tan and Lau 2011; Xu et al. 2013). 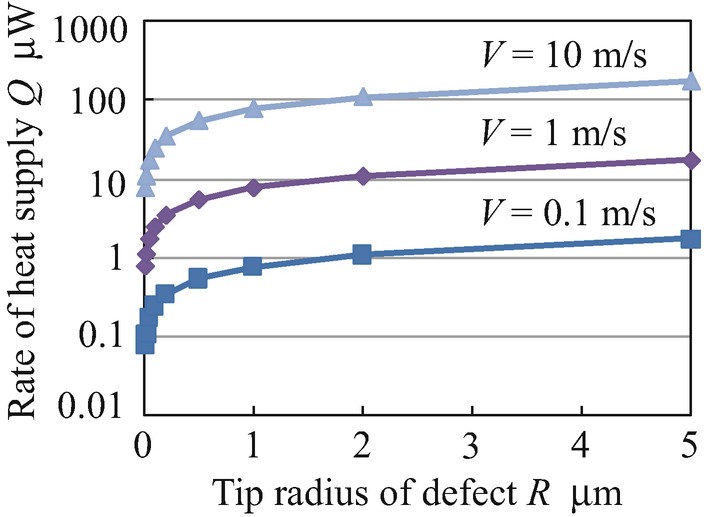 By employing a laser source having a shorter wavelength, resolution of defect detection can be improved (Meshulach et al. 2010; Montal et al. 2010; Wagner and Harned 2010), as well as by the improvement of photodetector sensitivity. Meanwhile, since the light intensity of scattered light is strongly affected by the defect size, it is getting harder to meet the criteria of the defect detection process required for state-of-the-art products. One of the other drawbacks of the laser scattering method is that some types of surface defects such as a flat-shaped defect are sometimes difficult to be detected by the method. A technological breakthrough is therefore desired to achieve further smaller defect detection. Aiming to realize next-generation defect detection, several methods have been developed so far (Attota and Silver 2011; Takahashi et al. 2011). A method employing a micro thermal sensor is one of these methods. 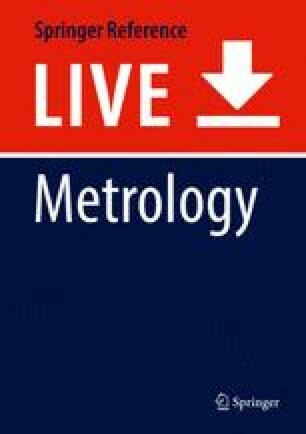 In this chapter, the principle of surface defect detection method based on the micro thermal sensor is at first described. After that, design and fabrication of the micro thermal sensor are presented. In addition, by using the developed micro thermal sensor, some experiments have been carried out to demonstrate the feasibility of the defect detection method. An example of the application of micro thermal sensor for surface defect detection in the hard disk drive industry is also introduced. A schematic of the surface defect detection method with a micro thermal sensor is shown in Fig. 3 (Shimizu et al. 2014a). In the method, existences of surface defects on a target of interest such as a semiconductor wafer, a magnetic disk or an optical flat having a smooth surface are verified by using the micro thermal sensor in such a way that the sensor detects frictional heat generated by a collision between the micro thermal sensor and a surface defect. As can be seen in the figure, the micro thermal sensor is made to scan over a surface of the target of interest while keeping a certain amount of gap. As long as the sensor is not contacting with the target surface, the sensor temperature will be kept constant. Meanwhile, when the target surface has a defect having a height higher than the gap set between the micro thermal sensor and the target surface, the defect will collide with the micro thermal sensor surface, resulting in the generation of frictional heat, as well as the change in temperature of the micro thermal sensor due to the frictional heat. Therefore, by detecting the sudden change in temperature of the micro thermal sensor during its scanning over the target surface, existences of surface defects on a target surface can be verified. The purpose of the above mentioned method is to verify the existences of surface defects on a target surface. A setup shown in Fig. 3 is one of the examples of how to arrange the micro thermal sensor and a target of interest. 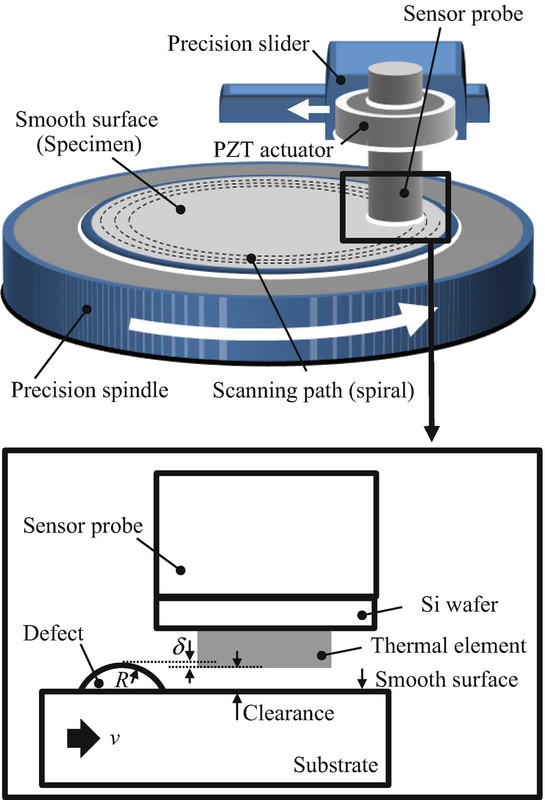 Surface defect detection can be carried out by rotating the target with a precision spindle while moving the micro thermal sensor along the in-plane direction. By synchronizing the acquisitions of output signals from the micro thermal sensor, the rotary encoder and the linear encoder, exact positions of detected surface defects on a target surface can be determined. The information of defect positions can be utilized to carry out further detailed investigation on the detected surface defects in the review process, which will be carried out after the defect detection process. A resolution of the surface defect detection, which is one of the important performances to be improved in next-generation surface defect inspection, by the abovementioned method will be affected by the sensitivity of micro thermal sensor to be employed in the system, as well as the amount of frictional heat to be generated by a collision between the micro thermal sensor and a surface defect. In the next section, theoretical analysis is carried out to estimate the amount of frictional heat by the collision based on a simple collision model between the micro thermal sensor and a surface defect. By using Eq. (7), the rate of heat flow to be generated by the collision between the micro thermal sensor and a surface defect is estimated. Figure 5 shows variations of the frictional heat as a function of the radius of asperity R. For the calculation of the rate of heat supply, the parameters summarized in Table 1 are employed. In the figure, the rate of heat supply calculated with a velocity of 0.1 m/s, 1 m/s, and 10 m/s is plotted. Equation (7) and the results shown in Fig. 5 indicate that the rate of heat supply Q increases in proportional to the velocity V and ranges from sub μW to several hundred μW. Therefore, the micro thermal sensor to be employed in the defect detection is required to have sensitivity enough to detect frictional heat with the rate of heat supply on the order of microwatts. where α is a temperature coefficient of resistance (TCR) of the micro thermal sensor and ρ0 is a specific resistance of the micro thermal sensor at a specified temperature. As can be seen in the equation, Δρ due to the change in temperature of the micro thermal sensor can be estimated by obtaining the change in its temperature ΔT. Meanwhile, it is not so easy to theoretically derive ΔT induced by the rate of heat supply Q by the frictional heat since the micro thermal sensor has a layered structure. Therefore, finite element analysis is carried out to estimate ΔT induced by the rate of heat supply Q. Figure 6 shows a schematic of the finite element model of the micro thermal sensor employed in this analysis. A micrometric thin metal film structure placed on a substrate surface is treated as the micro thermal sensor. Material property and dimensions of each component in the structure of micro thermal sensor employed in the finite element model are summarized in Table 2. In the simulation, a rate of heat supply of 20 μW, which is considered to be generated by the collision between the micro thermal sensor and a surface defect with a tip radius R of 100 nm under the condition of a velocity V of 6.28 m/s and an interference height δ of 10 nm, is applied to the surface of micro thermal sensor, and the change in temperature ΔT of the micro thermal sensor is calculated. 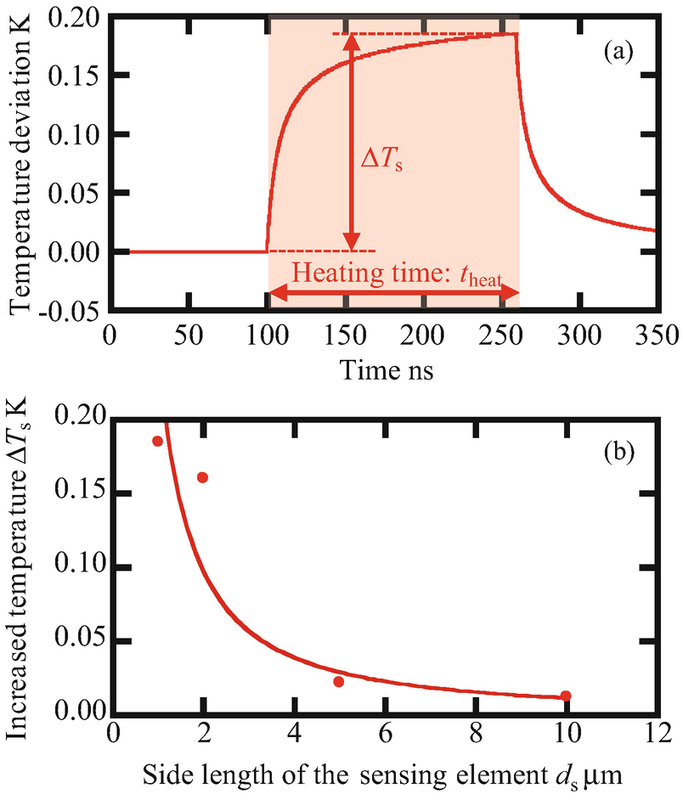 Figure 7a shows a typical temperature deviation of the micro thermal sensor as a function of time. In the figure, the simulated result with the sensor element having a size of 1 × 1 μm is plotted. The period of applying Q to the micro thermal sensor theat is calculated by the velocity V and the size length dS of the micro thermal sensor. A variation of the maximum change in temperature ΔTS due to the variation of dS is summarized in Fig. 7b. In the case of the micro thermal sensor having a side length dS of 10 μm, ΔTS is estimated to be 0.012 K, which corresponds to the change in electrical resistance Δρ of 1.2 × 10−3%, on the assumption that the micro thermal sensor has a TCR of 0.1%/K. Although the change in electrical resistance estimated based on the finite element model is small, it can be well detected by using conventional technology of the analog signal processing which can detect a small resistance deviation on the order of 1 × 10−4%. From these simulation results, it can be concluded the micro thermal sensor is expected to have an ability of verifying the existences of surface defects on a target surface by detecting frictional heat generated by a collision between the sensor surface and a surface defect. As described in the previous section, the micro thermal sensor is preferred to be designed as compact as possible to improve its sensitivity against the frictional heat. Photolithography process capable of fabricating small structures made of thin metal films is therefore one of the candidates for fabricating micro thermal sensor. 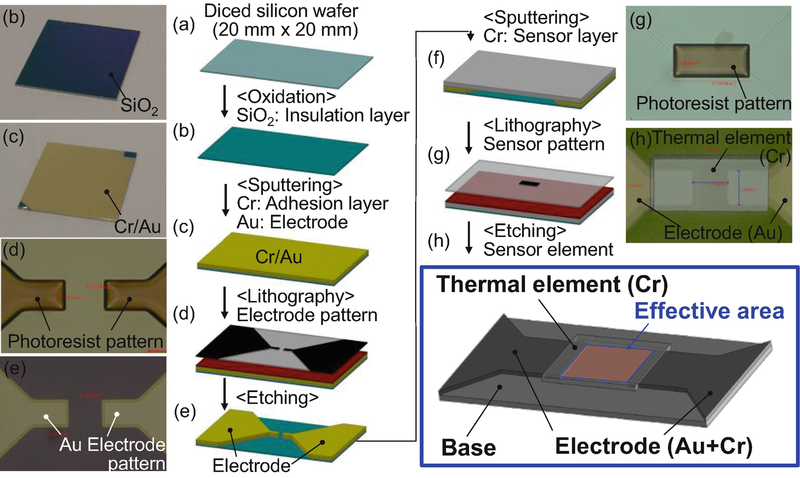 Figure 8 shows fabrication process of the micro thermal sensor designed based on photolithography process. In the designed fabrication process, a silicon wafer is employed as a substrate for the micro thermal sensor. After the preprocess of dicing and oxidation of the silicon substrate (Fig. 8b), photolithography process for the electrode patterns is carried out. At first, a gold film with a thickness of 30 nm is prepared on the substrate surface (Fig. 8c). It should be noted that a thin chromium film with a thickness of 10 nm is placed as the adhesion layer under the gold film to improve the binding force between the gold layer and the substrate. After that, a photoresist is spin coated on the gold film, and pattern exposure is carried out by using a photomask with the electrode patterns, followed by the development process (Fig. 8d). With the developed patterns, throughout the wet etching process, a pair of electrodes is fabricated (Fig. 8e). In the same manner as the fabrication of electrode patterns, a sensor element pattern made of thin chromium film with a thickness of 100 nm is fabricated in such a way that the sensor element will bridge the pair of electrodes (Fig. 8g). During the fabrication of sensor element, attentions should be paid to avoid damages to the existing electrodes on the silicon substrate due to over-etching in the process. 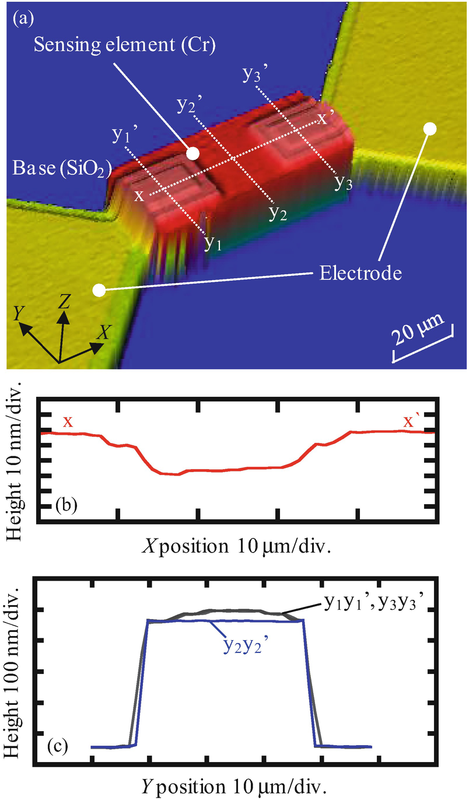 A three-dimensional profile of the fabricated micro thermal sensor measured by a commercial white-light scanning interferometer is shown in Fig. 9a. Since the sensor element was fabricated followed by the fabrication of electrode patterns, the sensor has cross-sectional profiles as shown in Fig. 9b, c along the X- and Y-directions, respectively. The width of the sensor element was designed to be 20 μm, while the gap in between the electrodes was designed to be 20 μm. As can be seen in Fig. 9, the micro thermal sensor was successfully fabricated by using the designed photolithography process shown in Fig. 8. 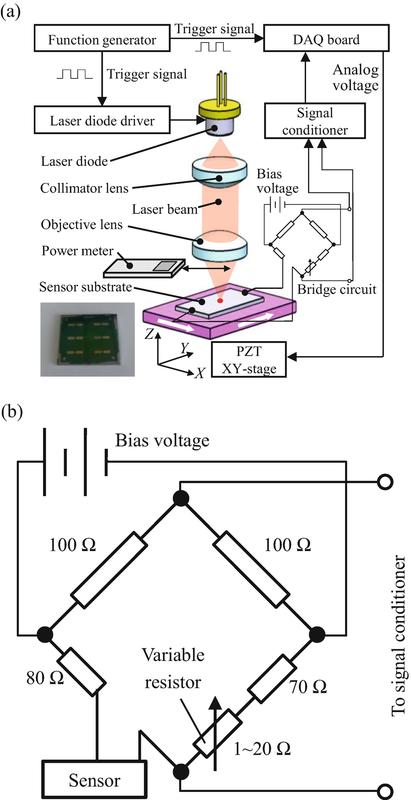 Basic performances of the fabricated micro thermal sensor as a thermal sensing device were evaluated in experiments by using an experimental setup shown in Fig. 10a. The setup was designed so that a known quantity of heat can be applied to the micro thermal sensor by using a laser focusing optical system. The fabricated micro thermal sensor was mounted on a three-axis precision piezoelectric (PZT) stage system capable of positioning the target with nanometric resolution and was placed beneath the laser focusing optical system. The micro thermal sensor was integrated into a bridge circuit as shown in Fig. 10b so that the change in its temperature could be detected as the change in its electrical resistance. The bridge circuit was connected to the commercial signal conditioner (CDV-700A, Kyowa Electronic Instrument). In the laser focusing optical system, a laser diode having a wavelength of 683 nm, whose emitting laser power can be controlled by using a laser driver, was employed as the light source. A laser beam from the LD was collimated by using a collimating lens, and the collimated laser beam was then focused on the micro thermal sensor by using an objective lens having a focal length of 50 mm. Regarding the diameter of the collimated laser beam (5 mm), a diameter of the focused laser beam was estimated to be less than 7 μm, which was small enough to heat the micro thermal sensor. In the following experiments, approximately 40% of the laser power was assumed to be absorbed by the micro thermal sensor, since the reflectivity of the sensor element was estimated to be approximately 60%. Figure 11 shows a typical voltage output waveform from the micro thermal sensor through the bridge circuit and the signal conditioner when the sensor was placed on the focal plane of the laser focusing optical system and was heated by the focused laser beam. As can be seen in the figure, the micro thermal sensor successfully detected irradiation of the focused laser beam onto the sensor surface. 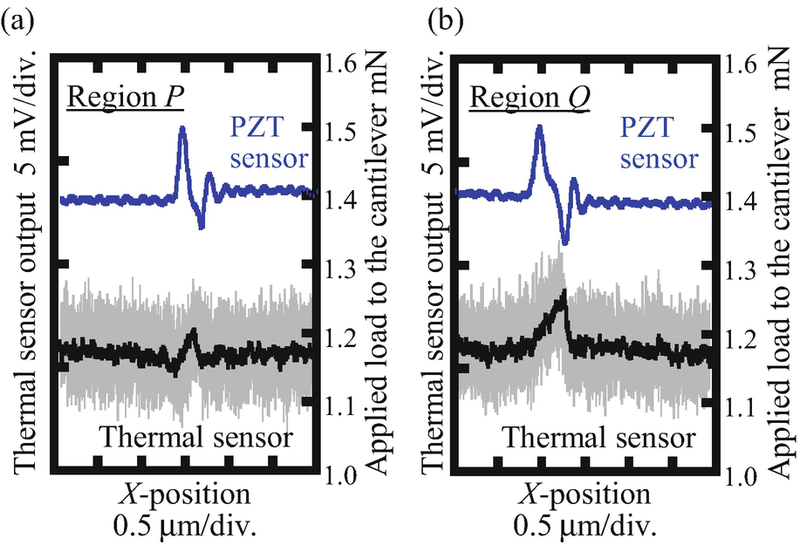 To evaluate the active area of fabricated micro thermal sensor, the sensor was moved in the XY plane by using the PZT stage in a step of 1 μm, while the change in voltage output from the micro thermal sensor was monitored at each sensor position. The power of the laser beam was set to be 1.25 mW (corresponding to a rate of heat supply of 500 μW applied to the micro thermal sensor) with exposure time of 50 ms. Figure 12a shows a microscopic image of the micro thermal sensor evaluated in the experiment, and Fig. 12b shows the contour image of the change in voltage output from the micro thermal sensor observed at each position, which corresponds to the sensitivity distribution of the micro thermal sensor. As can be seen in the figure, the active area of the fabricated micro thermal sensor was found to be the area between the electrodes. Sensitivity of the micro thermal sensor was also evaluated by using the same setup shown in Fig. 10. 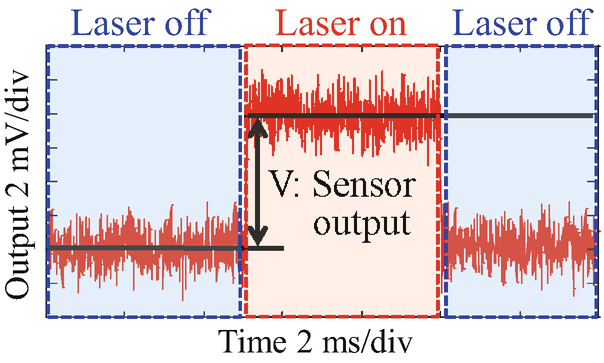 In the experiments, the focused laser beam was positioned to the center of the effective area of micro thermal sensor, and the change in voltage output from the sensor was evaluated while decreasing the laser power for heating the micro thermal sensor. Experiments were also carried out for the micro thermal sensor having an active area of 10 × 10 μm. Figure 13 shows the variation of voltage output from the micro thermal sensor with the decrease of the rate of heat supply applied to the sensor surface. As can be seen in the figure, the voltage output from the sensor increased almost proportional to the rate of heat supply Q in the region where Q >100 μW, while the sensor output rapidly decreased with the decrease of Q in the region of Q <100 μW. 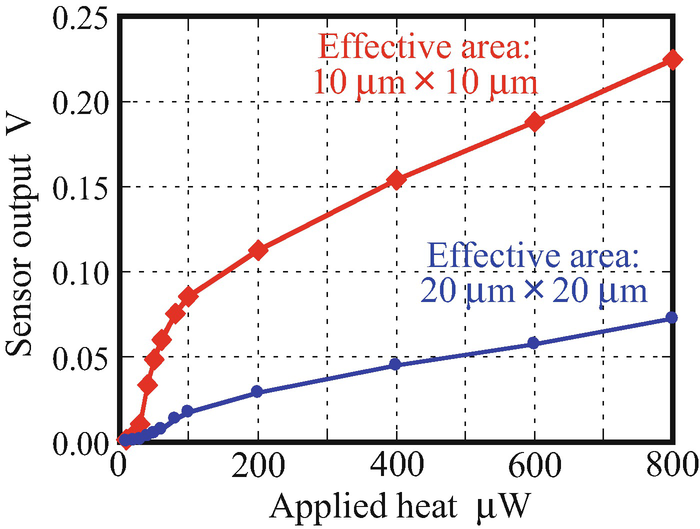 Meanwhile, it was verified that the micro thermal sensor having an active area of 10 × 10 μm could distinguish an applied rate of heat supply of 10 μW comparable to the quantity of frictional heat to be generated by the collision between the micro thermal sensor and a surface defect. Experiments were carried out for performance verification of the developed micro thermal sensor. 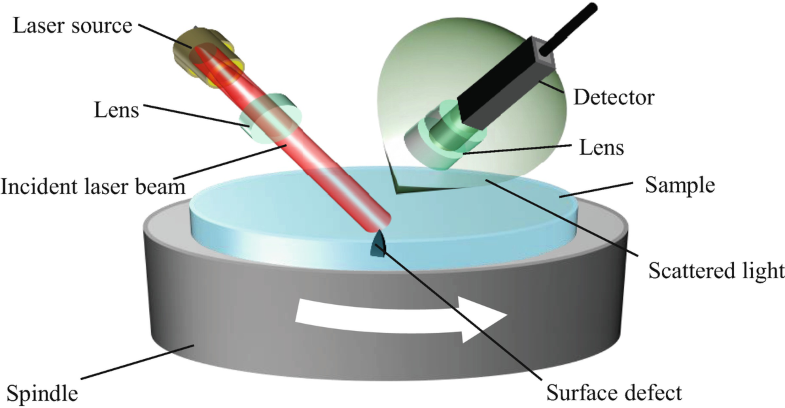 Figure 14a shows a schematic of the experiment, in which a micro ball probe was employed to simulate the collision between the micro thermal sensor surface and a surface defect having a relatively large diameter. The micro ball probe was prepared by assembling a glass ball with a diameter of 50 μm onto the tip of a glass probe (Gao 2010). Figure 14b shows a diagram of the setup constructed for the experiments. The glass ball probe was attached to the tip of a one-axis PZT actuator mounted on a linear slide capable of moving along the Z-direction. By applying triangular wave voltage input to the PZT actuator, the glass ball probe can be moved back and forth along the Y-direction. The fabricated micro thermal sensor, which was mounted on a three-axis PZT stage, was placed under the glass ball probe. Experiments were carried out in such a way that the micro thermal sensor was made to approach the glass ball probe being oscillated by the PZT actuator. 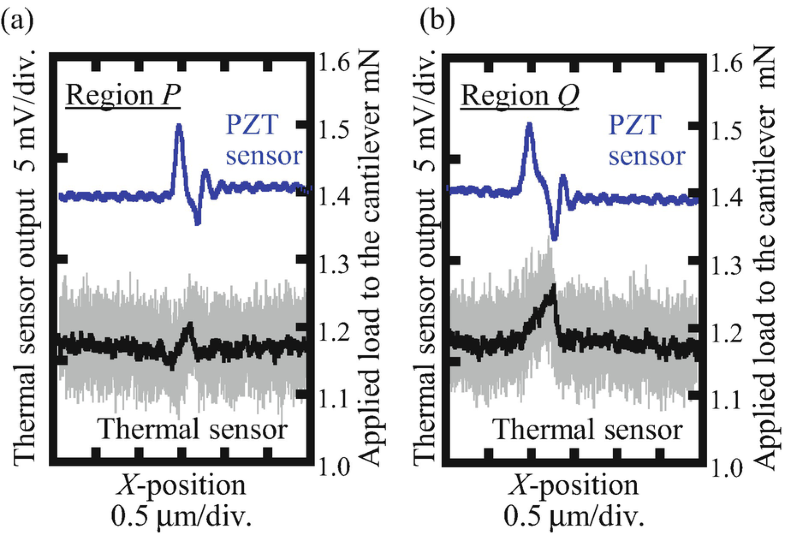 The micro thermal sensor was moved along the Z-direction in a step of 1 nm, and the waveform of voltage output from the micro thermal sensor was captured at each Z-position of the micro thermal sensor by using an A/D converter with a sampling rate of 10 kHz. Figure 15a shows a variation of the standard deviation σV in the waveforms of voltage output from the micro thermal sensor. As can be seen in the figure, σV was almost constant at the beginning of the approaching process. After that, σV started to increase with the increase of Z-directional displacement of the micro thermal sensor, which was considered to be due to the collision between the micro thermal sensor and the tip of the glass probe. Figure 15b shows the waveforms of voltage output from the micro thermal sensor at each of the Z-positions. It should be noted that the Z-directional position where the tip of the glass ball probe started to collide with the micro thermal sensor was determined by the data shown in Fig. 15a. An interesting thing was that the temperature of the micro thermal senor was found to decrease by the collision with the glass ball probe. Since the temperature of the micro thermal sensor became higher than that of the surroundings due to the Joule heating by the applied bias current, the heat flow from the micro thermal sensor to the glass ball probe is relatively larger than the frictional heat generated by the collision between the sensor surface and the glass ball probe, resulting in the decrease of sensor temperature. Experiments were extended to further verify the performance of the micro thermal sensor as the contact-detecting device. Figure 16a shows a schematic of the experiment, and Fig. 16b shows a schematic of the setup constructed for the experiment, which was similar with the one shown in Fig. 15b employed in the previous experiments. Meanwhile, instead of using the glass ball probe, a cantilever probe of atomic force microscopes (AFMs) having a PZT sensor was employed to simulate a collision between the micro thermal sensor and a small surface defect. The tip radius of the AFM probe employed in the experiment was approximately 20 nm. The PZT sensor was integrated into a bridge circuit to detect a contact force applied to the tip of the AFM probe. 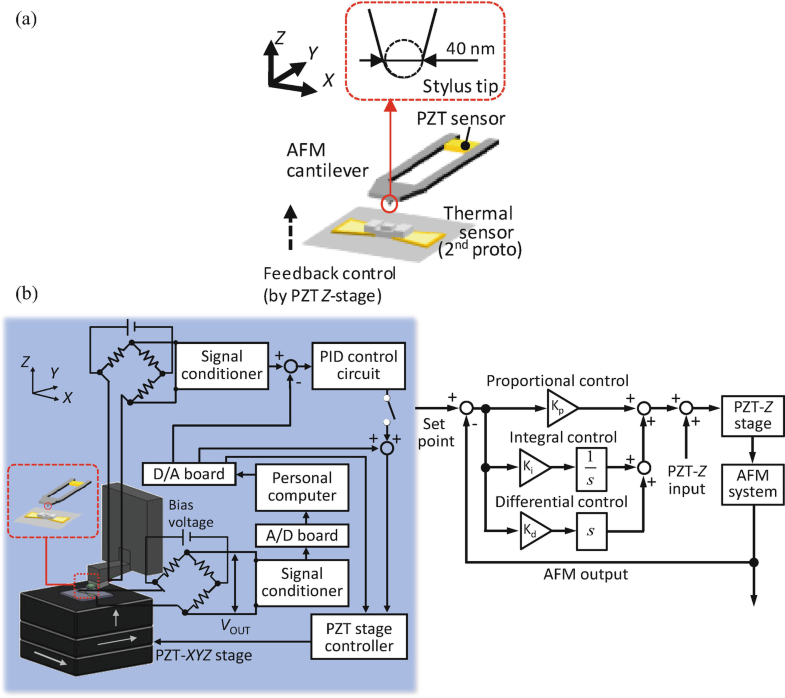 A PID controller was applied to the experimental setup so that the load applied to the micro thermal sensor through the AFM probe could be kept constant while scanning the micro thermal sensor surface by the AFM probe. Another feature of the setup was that the setup could acquire profile of the micro thermal sensor by utilizing XYZ-directional position information obtained by the capacitive displacement sensors in the three-axis PZT stage. With this feature, a fine positioning of the AFM probe tip with respect to the micro thermal sensor could be achieved. Due to the limitation of the setup employed in the experiment, it was difficult to apply relative motion in a high speed between the micro thermal sensor and the AFM probe. To simulate the collision between the micro thermal sensor and a small surface defect, the micro thermal sensor having a bump with a rectangular profile within its active area (Shimizu et al. 2015) was employed, and the collisions to be occurred when the probe tip of the AFM climbs up or falls off the bump were tried to be observed by the micro thermal sensor. Figures 17a, b show the waveforms of the voltage output from the micro thermal sensor when the AFM probe tip was made to climb up and fall down the bump, respectively. 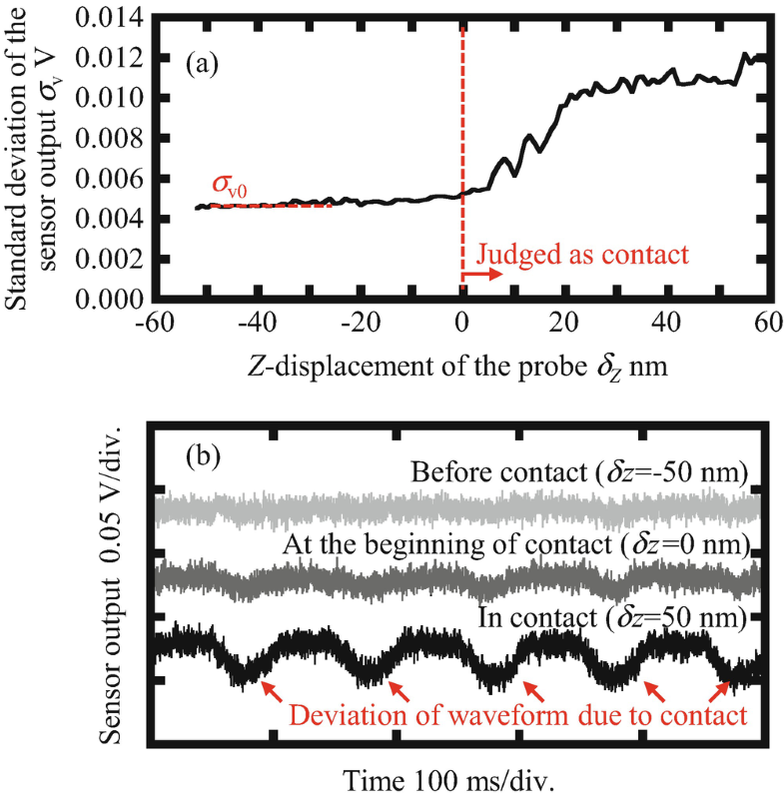 In the figures, waveforms of the output from the PZT sensor in the AFM probe were also plotted. Since the AFM probe was controlled in a closed loop, deviation of the output from the PZT sensor was observed only at the collision between the micro thermal sensor and the tip of the AFM probe. As can be seen in the figures, the micro thermal sensor showed positive responses at the collisions, which demonstrated the feasibility of the micro thermal sensor as the contact-sensing device. The concept of micro thermal sensor can be applied for industrial applications. Figure 18 shows an example of the micro thermal sensor employed in a magnetic head slider of hard disk drives for the detection of surface defects on a magnetic disk surface. In the case, a micro thermal sensor was embedded to magnetic head structures in a slider. The micro thermal sensor was placed between a read element and a write coil in a magnetic head structure so that the micro thermal sensor will be placed as close as possible with respect to a disk surface. Since a magnetic head slider is designed to follow the disk surface with a certain amount of gap, a collision between the micro thermal sensor and the disk surface will occur only when a convex-shaped surface defects exist on the disk surface. Figure 18 shows a typical response of a micro thermal sensor embedded to a magnetic head slider when detecting a surface defect on a magnetic disk surface. Due to high sensitivity of the micro thermal sensor and high-speed in-plane motion between the sensor and a rotating disk surface, even a small surface defect having nanometric height can also be detected. Figure 19a shows the image of a certain area of a disk surface observed by a conventional laser scattering method, where the micro thermal sensor found the existence of a surface defect. As can be seen in the figure, the conventional laser scattering method could not find out the existence of a surface defect. Meanwhile, the micro thermal sensor successfully found the defect, whose SEM image is shown in Fig. 19b, having a diameter and a height of less than 200 nm and 10 nm, respectively. 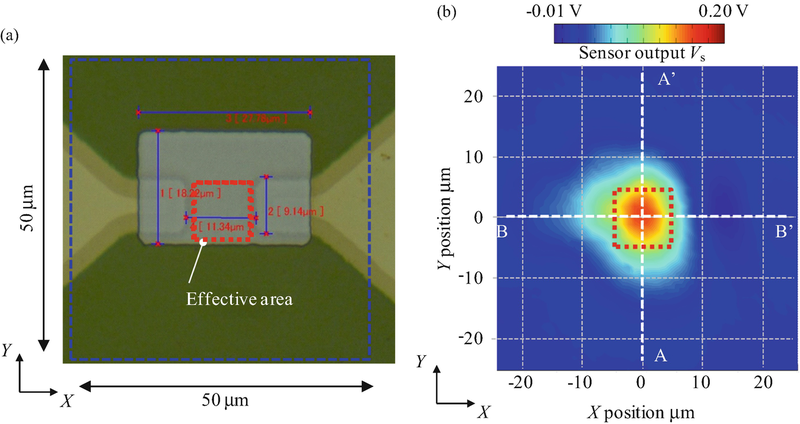 As has been demonstrated in this experiment, the micro thermal sensor can be employed as a highly sensitive contact sensor for surface defect detection (Fig. 20). In this chapter, design and development of the micro thermal sensor for surface defect detection has been described. 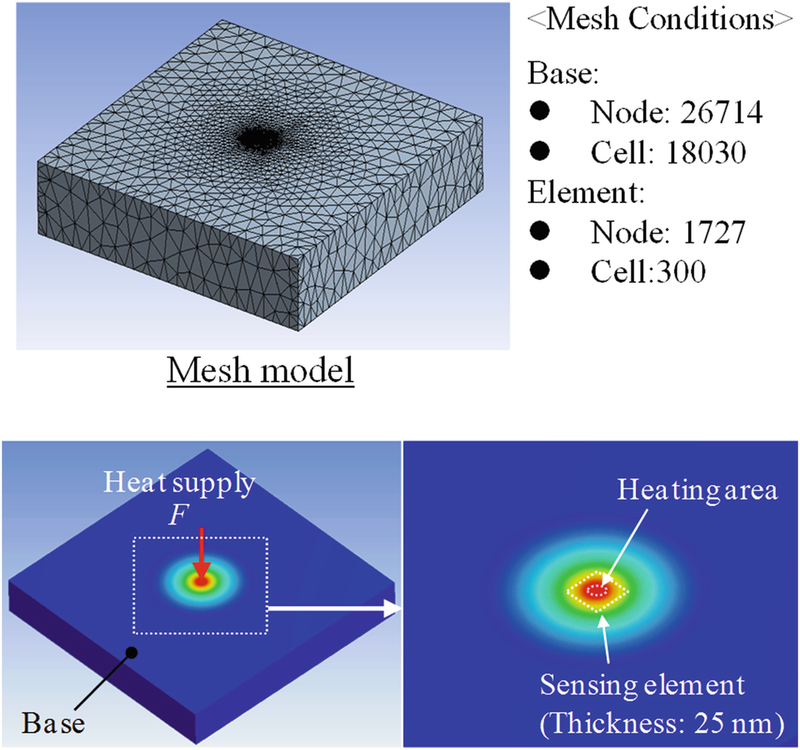 Throughout some basic experiments, feasibility of the developed micro thermal sensor as a thermal sensing device and a contact detection device has successfully been verified. In addition, an industrial application of the micro thermal sensor for a magnetic head slider has also demonstrated that the surface defect detection by the micro thermal sensor could be a powerful tool for evaluation of the surface quality of magnetic disks. Since the micro thermal sensor can be fabricated in a simple manner, the sensor is expected to be employed in various industrial applications which require components having smoothly finished surfaces. Meanwhile, one of the disadvantages of the surface defect detection by using the micro thermal sensor is that at the moment of collision the surface defect detection could give damages on a surface defect, a precise investigation of which will be carried out in the review process followed by the defect detection. An establishment of a nondestructive method for the surface defect detection with the micro thermal sensor is therefore desired, which will be carried out in future work.